on july the 6th 2017, you sadly had to leave us. I am still so worried about your passings, I can´t believe it. In the wrestling world, people called you Moondog Fifi, trained by the Fabolous Moolah. In the 80s, you had an amazing hair cut that would have made you a perfect character for every classic beat´em up video game! In the end, you´ve kicked a lot of butts inside of the ring - a video game wasn´t neccessary at all. You´ve even won some matches side by side with Moolah, which is also very cool. I´m pretty sure that loads of your matches have never been recorded. Since I was born in 1987, I discovered wrestling in the late 90s for the first time. That means I didn´t know who you are.. until 2011. You came to Germany to take part of the Wrestling Legends Tour, organized by Crazy Johnny Tiger. You´ve faced Blue Nikita in a match, which she sadly won. But I´m telling you she cheated. She always cheated, that´s what she did! During that match, me and my friends were chanting "USA, USA!". You took notice of that, looked over to us and answered: "Yeah yeah, USA USA!". Years later, and still today, we are still imitating it because you gave us an unforgettable moment with this! Thank you Diane for this amazing moment. At this show, I took a photo of you and Joe E. Legend. It is one my most favourite photos, because I made a great snapshot of you both. A short time later, you gave me an interview for a wrestling website I had at that time. I re-released that interview on my website on here in early 2017 to make this interview to be unforgotten. In the years after this show, people met you at conventions together with your fellows Wendi Richter and Leilani Kai. Pretty cool, for fans and for yourself because you were able to meet some awesome people. Two of these people are Frankie Kazarian and Christopher Daniels, whom I met back in 2010. I love this photo! In the following years, you had a lot of surgeries - way too many! Often enough you told on your Twitter account how thankful you are to be still alive after all those surgeries. And then, after all those operations you´ve successfully survived, there was one more knee surgery to come that was too much for your body to withstand. In my opinion, it is so ironic that a harmless knee surgery knocked you out. Why didn´t you grabbed the destiny to give it another Power Bomb? 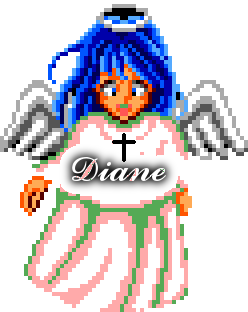 Well, I guess we all have to lose our very last match in life, but in your case, it was way too early, dear Diane. Thank you for being so nice to us, thank you for the great time and moments you gave us. Wherever you are now, please keep in mind that we never forget you!